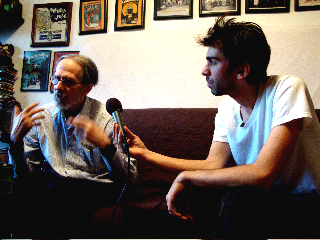 On today’s show I speak with Robert Crumb. R. Crumb is best known as a cartoonist and illustrator, but what a lot people don’t know about him is that he is a very talented old-time mandolin player and a very serious collector of 78rpm records! 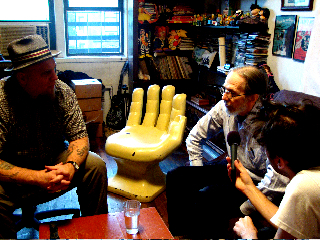 I caught up with Robert Crumb at John and Eden (The East River String Band)’s apartment over on the Lower East Side in Manhattan. We had a good talk about Crumb’s interest in the old music and his early experiences finding old 78rpm records in the same junk shops where he searched for old comics as a kid. He has traveled extensively in search of records! meeting interesting personalities in strange places, from Delaware and Cleveland all the way to Argentina and Uruguay. Robert Crumb plays live on the show together with Eden and John’s East River String Band. Thanks to John Heneghan for supplying much of the music for this program. And don’t forget to check out our good friends at the Old Time Herald Magazine – www.oldtimeherald.org – lots of great articles, reviews and more! Thanks Eli, Robert, John, and Eden. Very enjoyable interview and fantastic music.Love that Luperce Miranda tune! And very glad you included 2 tunes from ERSB’s new album Be Kind to a Man When He’s Down.Again, thanks for sharing the rarities on shellac and thanks also for the informative conversation. First time I listened to the radion in 30 years-HAH, it was worth the wait! Thanks to John and Eden, who turned me on to this interview, I spent a good long while picturing Robert rambling on about stories searching for these GREAT OLD TUNES and the weird allusions to colors and chords??? Plaid??? What were y’all drinkin’??? Couldn’t travel to New York to catch the Jalopy show, but you can count on John, Eden, Robert and company to be puttin’ on one heckuva show. Take note that Robert and John, both, have incredibly clean sounding rare 78’s that nobody’s heard in 80 years! And probably multiple copies to boot! I could on and on about all of the music and Robert’s extensive history with it, but the old music is not ‘archaic’ or ‘strange’. Remember, these old 78’s are the beginning of recorded sound, and everything we have now is a direct descendant and goes full circle sooner or later! The whole universe is held together by musical strings, our brains are hard wired for the stuff, and we simply can’t exist without it. One string cigar box guitars or massive mountains of electronic toys, anyone can play music if they just let it out, like Robert and ‘playing by ear’. Man! What a great interview! ‘Til next time, give ’em all a good shellacin’, and THANKS for filling up my night with something other than the ‘cultural hum’…. I am an XM subscriber to the Down Home Radio Pod casts. Thank you Eli Smith for this priceless radio show. The fact is, if you are a 78 collector, like I am, you want the authenticity from that time. You do not warm up to reinterpretations of white people who are covering original blues artists from the Jim Crow era. Playing it yourself is something quite different. But I too saw the documentary, and I have to say I had almost the same cringe. I too hate 60’s folk versions of Carter Family etc by Joan Baez and Judy Collins. I do disagree about Dylan tho. He is one of my favorites.